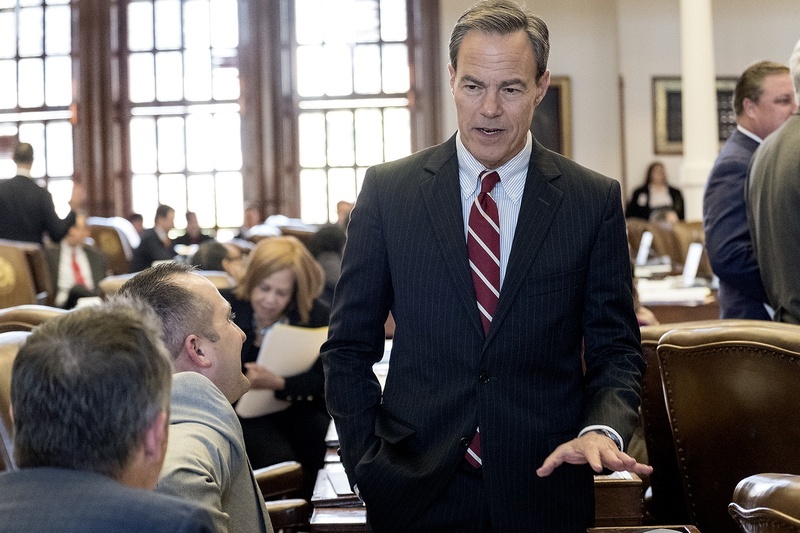 Yesterday, April 6th and into the early morning hours of today, the Texas House debated and passed a budget for the 2018-2019 biennium. Each session, the Texas Legislature is required by constitution to pass a balanced budget. It took 15 hours, but the Texas House passed it by a vote of 129 to 18. House Appropriations Committee version of the fiscal 2018-2019 budget authorizes a total spending of $218.2 billion. This comes after the Comptroller's Fall 2016 economic forecast, as reported in his Biennial Revenue Estimate, of continued moderate growth of the Texas economy in fiscal 2017 and in the next fiscal biennium. This is due in large part to continued weakness in the oil and natural gas industry and reduced sales tax collections. The budget going forward is balanced by cutting spending and using a modest amount of the Economic Stabilization Fund, and not by relying on budget gimmicks or trickery. More importantly, it addresses critical needs of our State such as additional funding for schools in Texas. It also funds our state's Medicaid program, Child Protective Services, transportation, border security and Teacher Retirement and Health Benefits. After a long and at times impassioned debate, the House passed its version of the budget just after 1:30 a.m. Up next will be a conference committee between the House and Senate to reconcile the differences between each chamber's budget. 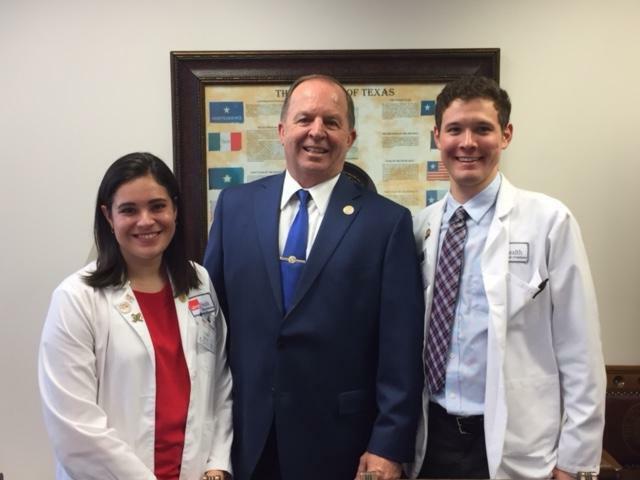 Every first Tuesday of each month, the Texas Medical Association brings medical students from all over the state to the Capitol in Austin to meet with legislators. This time I met with UTMB students Victoria Petruzzi and Robert Good. I wish to thank them for representative UTMB. On Thursday, April 6th I was able to visit with some wonderful women of the Texas Federation of Republican Women. 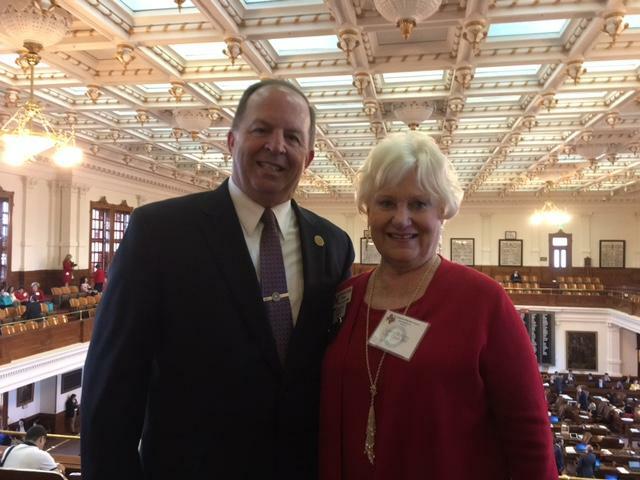 Pictured here with Loretta Roberts of the Clear Creek Republican Women. 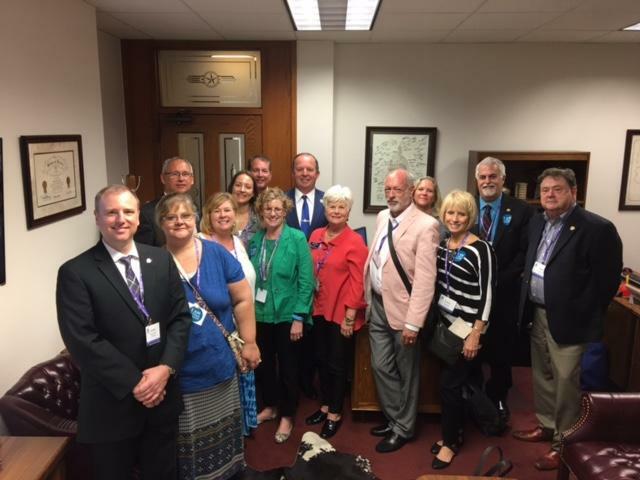 I was honored to visit with some constituents who came out for Texas Realtors Day at the Capitol! Senator Taylor visited us on the House floor this week. 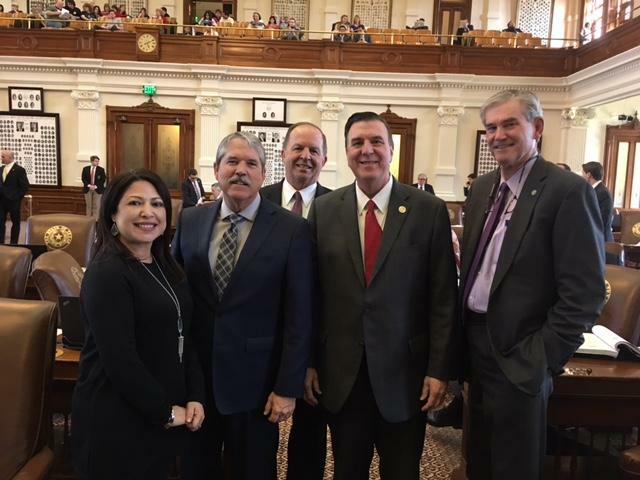 Pictured are most of Senator Taylor's Representatives in his district, Mary Ann Perez, myself, Dennis Paul, and Ed Thompson.